Massey Ferguson 200 Series MF Advanced | Belize Diesel & Equipment Company Ltd. The 200 Series Advanced family comprehends more than 500 versions among the eleven models from 50 to 130 hp. This great number of versions meets the widest range of agricultural applications, from the most common to special applications. Agriculture has advanced in new crops and new practices that require a new performance and specific features from tractors so as they can fulfill these activities which are more and more sophisticated. In each model we will find a version that suits the specific needs of each application. The 200 Series Advanced tractor also meets another important need farmers have using a simpler application where it can be employed effectively and with low cost. This way the 200 Series meets the needs of all technological levels, from the lowest cost to GPS navigation in the application of variable rates of inputs. You can always count on Massey Ferguson dealer to have all the service support you need to keep your combine working at maximum capacity. Counting on this important support during the machines working life, you can perform periodical revisions and maintenance safely. But that’s not all. By using Massey Ferguson original parts, you also contribute to enhance your combine’s life. Developed with high quality standards, the original parts offer you more value for money, besides being a guarantee of durability and productivity in any kind of terrain. In the 200 Series Advanced, farmers will find the ideal tractor to plant grains fast with high-flow, variable flow and independent power take-off resources. Farmers who adopt precision farming may use GPS for navigation and variable rate application of inputs in all cab models the 200 Series Advanced. Excellent hydraulic capacity, tires fro specific operations, reduced turning radius, balanced weight distribution make the 200 Series Advanced tractors powerful allies in tilting, planting, cultivation task and sugar cane harvesting. Environment with the air filtered in active charcoal, spreader controls located inside the cab, make spreading operations safe and comfortable. The different operations in citrus plantations, such as mowing, spreading, fertilizing, soil correction, and harvesting are performed comfortably with the compact or standard versions. Good stability, easy maneuvering, superior PTO, easy coupling, reversible transmission, and low consumption are attributes that make hay and forage operations simple and fast. The easy and fast implement shifting saves time between operations. The 200 Series Advanced tractors have ideal features for the performance of all tasks comprising the process of potato growing. They are sufficiently light to preserve the soil, have enough power for each operation; adequate tires that provide appropriate ground clearance, balanced weight and hydraulic power to move the planters. 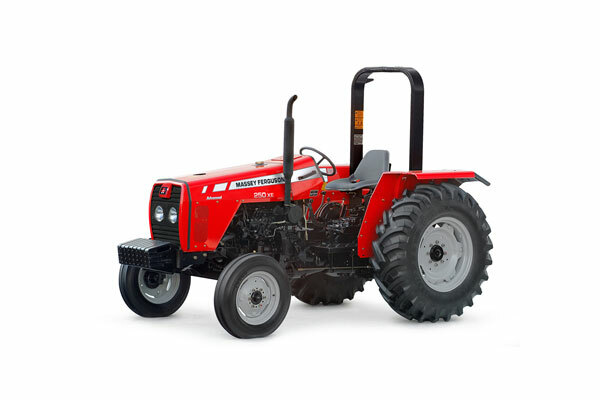 The engines equipped in the 200 Series Advanced tractors are genuinely designed for applications in tractors. The most important features of these engines include low rpm at maximum power and high torque at maximum rpm. These features deliver superior performance to tractors with work speed maintenance. Polyurethane tanks provide excellent autonomy and preserve fuel quality, keeping it free of oxidation and corrosion. The different types of transmission that may configure the 200 Series Advanced models allow the most appropriate selection for a wide range of tractor applications. They can be synchronized, constant mesh, shuttle and reversion. Yard operation and operation with restrict dimensions may be performed in less time through gearshift levers with reversion from ant gear. The 200 Series Advanced is prepared to work with all technological resources that modern agriculture requires. This comprises the light bar, variable rate application of inputs (forecast and performed), route maps, area worked, work speed, slippage, engine water temperature, engine oil pressure, and work time, referenced by GPS. This means having data available for full and quick cost control. Designed to transmit all the power available in the engine, this system is easy to engage and accurate when transmitting power. The option from 540 or 1000 rev/min allows choosing the most economic way of operation. The speed indication on the instrument panel facilitates rpm settings to the desired level. A friendly reading panel with important information allows the operator to follow and develop the work enhanced performance and quality. The combined flow of the three-point linkage circuits and hydraulic control is available as standard item in models MF 265 to MF 299. The flow rates are activated by the lever located under the operator’s seat. The fenders wrap the operation’s station protecting it against material that may occasionally be thrown by the wheels. Fender extensions mat be used to protect plants and fruits from tire interference. Visibility over the work is complete, even during night operations lighting offers a complete view around the tractor. The platform forms an integrated assembly with the fenders, floor, and deflectors that isolate discomfort factors such as mud, heat, and crop residual objects. A proper compartment provides space for personal belongings, which is essential for the operator’s comfort while working. The sugar cane loaders mounted on 200 Series MF Advanced tractors are extremely versatile and have resources that are not available in other solutions. Rear wheel tracks are easy to adjust (PAVT) for minimum or very wide settings, and increase stability in sloped terrain or provide a quick adjustment for row spacing. Another exclusive solution of sugar cane loaders mounted on 200 series Advanced tractors is the synchromesh or automatic transmission (automatic reversing), as solutions allow increased productivity and provide comfort to the operator. The wide range of tire options allows using the 200 Series Advanced in specialized work with high ground clearance without damaging the plants. The light models, from MF 275 to MF 290, had their fuel autonomy expanded through polyurethane tanks located under the platform. It’s 100 liters of fuel stored in a corrosion and oxidation –free tank. The auxiliary hydraulic system is more versatile offering a greater number of possibilities of applications with high flow and pressure, allowing superior hydraulic power if compared to other tractors in the category. Different value body settings provide the ideal solution for all applications, and they can be either spring centering, quick release or variable flow for the actuation of hydraulic motors. The intake air pre-filter for engine brings an additional innovation. Apart from eliminating primary residues, it does it with no need for routine maintenance. Dirt is returned to the environment while the air is being filtered, excluding the manifold and respective discharge. This way, the engine receives cleaner air and time spent with maintenance is reduced. The access to tractor routine checking points is extremely easy and fast to perform. It’s not necessary to fold or move the covers, as everything is at hand and at sight. The metal shield is securely fastened, safely protecting the parts in motion from accidental contact. Additionally, the operator is protected from discomforts that may be caused by the wheels or the kind of work. The electrical cables are protected by a coating layer that protects them against wear caused by interference, superficial damage, rodents, and flame. The connectors also offer improved safety, as they are sealed against humidity and are strategically positioned to make tractor maintenance easier.